If you own a Lenovo k8 plus, and after the hard reset if you stuck at google account verification screen then here we will solve your problem by unlocking FRP lock from your device, so just follow this process that helps Bypass FRP Lenovo k8 plus, there is a couple of methods to unlock FRP from your device but we share here the latest and easiest method to XT1902-02 FRP with FRP Bypass File. This phone has some strong features, the front camera of this phone is good enough to provide crisp and clear selfies and the storage of this device is sufficient enough to store a big amount of images, videos and kinds of music, XT1902-02 has a decent processor and RAM management is very good while you do multitasking with this device. 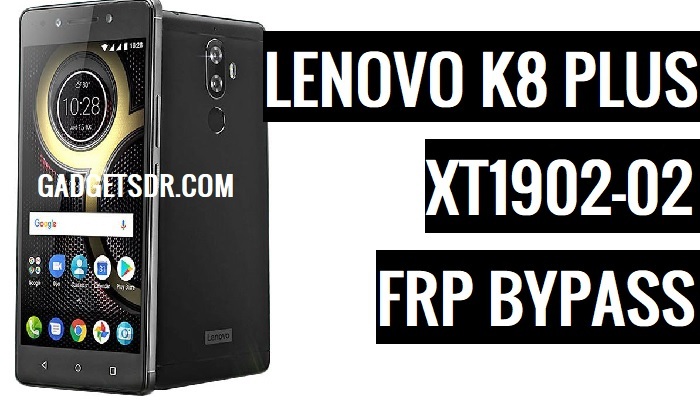 You can follow this method on any XT1902-02 FRP, Only you need a good internet connection and download some files To Bypass FRP Lenovo k8 plus. Warning:- This method is only for the device owner. Note:- This method is successfully applied to Lenovo k8. Caution:- We are not responsible for any damage to your Device. before you try this method backup your Full data. -Download first prog emmc File:- (Download Agent) file that helps you to detect your device in SP Flash Tool. -Lenovo K8 Plus frp Bypass file and Tool:- It’s a new tool for remove frp. -Download & Install MTK USB Driver. -Follow the Below guide carefully. -Open the “USB Driver” folder, there you will see a “setup.exe” file. -Install the “Setup.exe” file by double tapping on it. -Then hit next -next-next -finish to install the MTK driver to your computer. -Done. now your device will easily detect on PC. -First, you have to download all the frp files and tool to your computer. -Once downloading finish, copy all the files to a new folder. (to understand easily). -After that, extract all the downloaded files one by one using 7zip or WinRAR. -Once done, now there you will see “3” folders. <i> FRP Bypass Files, <ii> FRP tools, <iV> DA File. -Extract “FRP Tool” and “FRP File” on your PC. -Then open the FRP tool folder. -There you can see “SP Flash Tool” folder. -Open “SP Flash Tool” folder. -Then find and Run as Administrator “SP Flash Tool.exe”. -After that, Goto “Download” tab. -Now Click on the “Choose” from the “Download-Agent” that helps you to configure your device in the SP flash tool. -Now Give the file path of boot file “MTK-ALL-IN-ONE-DA.bin”. – file on extracted frp files folder. -Now give there file path of “Scatter.txt” file from the “FRP File” folder. -Go to the format tab to Bypass FRP Lenovo K8 Plus XT1902-02 (See Below image). -Select “Manual Format Flash” from that tab. -Give below address from that box. (or you can find Address also in your FRP File by Gadgetsdr folder). -After changing the value, you have to connect your device to PC. -While connecting press (Volume Down) key, and connect your device to PC. Note:- Make sure, before you connect your device to PC, you need to download and install USB Driver first on your PC. when you connect your device to PC keep pressing Volume down key few more seconds after connecting. -After that, Click on “Start” button from sp flash tool. -Once the flashing process is finished, you will get a “Right exclamation mark” popup. -Now you have successfully Lenovo K8 Plus XT1902-02 FRP. -Now just disconnect your device to PC and Power On your device. Thanks for visiting us, Comment below if you face any problem With Bypass FRP Lenovo K8 Plus XT1902-02 with Latest FRP File, we will try to solve your problem as soon as possible. you can check other some tutorial here to help you.